On her way out for cocktails in the iffy Melbourne neighborhood called Little Lon, Phryne Fisher rescues a young woman who is about to be attacked by three menacing thugs. The woman, Polly Kettle, tells Phryne she is a reporter on a hot story about three young, unmarried, pregnant women who disappeared from a nursing home where they were waiting to deliver their babies. 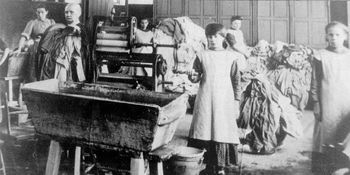 During most of their pregnancy, the women had been made to atone for their sins by being forced to work in the Magdalen Laundry at the Abbotsford convent. The day after the Little Lon adventure, Polly is kidnapped, and Phryne's friend, police detective Jack Robinson, asks Phryne to help find Polly, since Phryne is better suited to wheedle information from the brothelkeepers Polly had been asking about the missing women. Phryne's investigation takes her from the brothels to the slum home of one of the victims, to the (worse yet, to Phryne) middle-class homes of other victims, to the nightmarish Magdalen Laundry, and more. Even for the normally unflappable Phryne, what she learns about what can happen to unprotected young women is shocking and disheartening. Although this story has as much verve as any Phryne Fisher novel, it tackles serious subjects in an affecting way. Young women who became pregnant in the 1920s were often rejected by their families and forced to go into unpaid servitude in convents, working in dreadful conditions and subject to whatever discipline the nuns wished to apply. Women had few legal rights and protections and could lose their freedom in many ways, as illustrated vividly in this novel. Phryne can't right all the wrongs of Melbourne society, but she's determined to help as many women as she can and, almost as important, mete out rough and suitable justice to their victimizers. 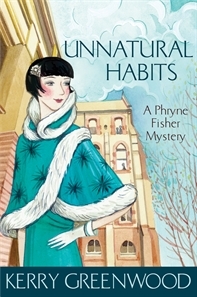 I confess that whenever I read a Phryne Fisher mystery (this is the 19th in the series), I squirm a little, because Phryne is just too good to be true. She's rich, beautiful, brilliant, able to outwit any villain and conquer any opponent. She collects devoted friends and dependents (doctors, society do-gooders, cabmen, wharfies, street urchins, assorted denizens of the demimonde; you name it) who enthusiastically become part of her detective team. Whenever Phryne needs help, there is always somebody ready to hand with the necessary resources who is eager to spring into action. Her allure is so overwhelming that even her lover's wife is her friend. And anyone who opposes her fears her––or is taught to fear her. Could there be such a superwoman today, let alone 90 years ago? What I have to remind myself is that the Phryne character is a feminist fantasy figure, wielding a sword of social justice. And what's wrong with that? James Bond is a fantasy figure (of a different sort, obviously!) and nobody seems to mind that one bit. So I resolve to go with the flow and enjoy this fantasy figure and her fantasy life––which, in this book as always, includes colorful, extra-legal and oh-so-deserved punishments for bad guys; socialist workers who treat Phryne as a valued comrade; and hookers with hearts of gold. Ponche á la Parisienne: Boil 1/2 pint of water and 1 lb. of sugar; when it comes to the thread, add the oleo-saccharum of 1 lemon [I've discovered that is a sweet oil made from citrus peel and sugar] and juice of 2, 1-1/2 pint of brandy, and 1/2 pint of rum; let this heat, but not boil; pour it in a hot bowl; set fire to it; stir it well, and pour into glasses while blazing. I think I'll choose a more traditional Phryne favorite, like a White Lady (2 oz. gin, 1/2 oz. Cointreau, 1/2 oz. lemon juice and 1 egg white, shaken with ice and strained into a chilled cocktail glass). I suggest you do the same and raise a glass to what might be the best Phryne Fisher book of the series to date. Unnatural Habits will be published in hardcover by Poisoned Pen Press on January 1, 2013. It is currently available in audiobook form from Audible.com. Note: I received a free publisher's review copy of Unnatural Habits. A version of this review may appear on Amazon and other sites under my user names there. Thanks for this review. I am a devotee of Phryne's myself. I can hardly wait to pick this book up. It's 7:30 a.m. where I live, Sister, so too early for one of these cocktails, but not too early to put this Kerry Greenwood book on my to-be-read list so I can meet Phryne Fisher.